After garnering a big add at Z100 in New York City after its premiere earlier this week, it looks like the debut single by DNCE, a song called “Cake By The Ocean”, may provide the perfect recipe for pop radio playlists. The lead singer of the new group brings a familiar name back to the music scene: Joe Jonas, brother of Nick and one of the three Jonas Brothers. The middle Jonas released his solo debut in the fall of 2011, Fastlife, but its two singles, “See No More” and “Just In Love”, just didn’t connect (the former went to #43 at pop radio and the latter didn’t chart) and the set came and went. In 2013, an ill-fated project that brought the brothers back together yielded two more self-released singles, “Pom Poms” (#45) and “First Time” (#36), before a cancelled album and tour derailed the whole thing. That essentially brings us to the current day, as DJ Jonas gets back into singing… and a potential run up the radio listings with a cool chart confection. Honorable mention goes to Cake, who almost went top 40 (#44) on R&R in 1999 with “Never There”. 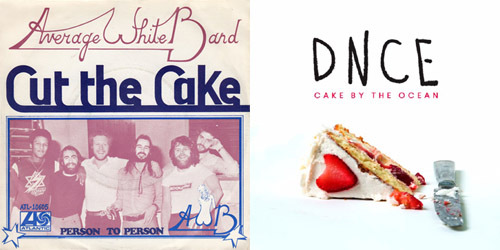 A “Poundcake” also hit #1 on Billboard’s Mainstream Rock chart in 1991 for Van Halen. Don’t forget about Cookie And The Cupcakes and their string of charting singles, or The Cookies and the one top ten hit of their career, 1963’s “Don’t Say Nothin’ Bad (About My Baby)”, a #7 record on the Hot 100. Hot Apple Pie made the Country survey about a decade ago, and Humble Pie reached the Hot 100 four times in the 1970’s and 1980’s. Want a slice? Sweet tooth still has you craving more music? Have a favorite pop pastry from the ones above? Let me know in the comments or on social media by using the “Get Social!” tab. They may be new to you, but they’re pretty hot on YouTube and have been featured on other major sites. The sextet that is Cimorelli originally formed as a quintet back in 2007 in their hometown of Sacramento, adding one other member in 2010. The six sisters in the band are Amy, Christina, Dani, Katherine, Lauren and Lisa. They simply began uploading videos and playing small gigs back then. Something caught on, and the girls found themselves with a huge social following, amassing 10 and 15 million hits on covers of songs like Anna Kendrick‘s “Cups (When I’m Gone)” and Maroon 5‘s “Payphone”. Universal Republic Records signed them in 2011, putting out a largely covers EP titled CimFam. Late in 2012, the group released an EP Believe It, and the title track got a bit of play on satellite radio, but never caught on nationally. Now, with the help of their label, they’re ready to hit the big time with patriotic “Made In America”, coming out just in time for Independence Day on July 4. The song, as you’d expect, is about pride in being an American, regardless of age or where you’re from in the States. It’s your standard pop/rock tune, with chants of “M-A-D-E I-N America!” throughout the song, which give it a nice touch. Plus, it has all the harmonies and strong vocals you know them for online. It reminds me a bit of a modern-day take on Wilson Phillips or Mulberry Lane. They’ve got the chops; let’s see if radio “in America” actually wants it. Putting down the pom poms. These three brothers from New Jersey thought a song about cheerleading would lead them to the top of the pack, but unfortunately, the halftime show came and went without much fanfare. 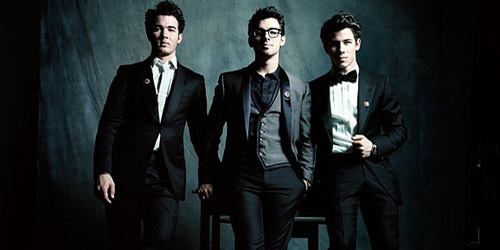 That underperforming single from Joe, Kevin and Nick was “Pom Poms”, which had an early leak date and a front-loaded sales week, and ultimately couldn’t hold itself together because the single was self-released and there was little support for it. However, a #60 peak on the Hot 100 for their leadoff single didn’t seem to get these guys down. In April, shortly after the single faded away, it was announced that they had signed a worldwide licensing deal with Universal Music Group, meaning that will likely be distributed and promoted by them. That’s obviously a huge step in the right direction considering this is a major label and can give the single the proper treatment. Though an album has yet to be issued, this second release from the effort is already miles ahead of “Pom Poms” in the quality department. “First Time” sees the boys with a very chilled-out, 80’s-influenced vibe, sort of like Maroon 5‘s current radio single, “Love Somebody”. It’s a more mature sound from them both lyrically and musically, but it fits right in with what’s on the air. Plus, you know you can’t deny singing along to the “oh oh oh oh” parts. It’s proved to be a popular track in concert for the Jonas Brothers on their few live dates, but will it do the same at radio and retail? “Time” will definitely tell. Which side are you on? Are you rooting for the sisters of Cimorelli or the Jonas Brothers? Both? Let me know! Comment below or find me on Twitter: @AdamFSoybel. Oh Mickey, you’re not so fine anymore. Download “Pom Poms” on iTunes. / Listen to “Pom Poms”. Watch the video for “Pom Poms”. This is the first release from the Jonas Brothers on their own label, Jonas Records, after leaving Disney’s Hollywood Records after their last album. It was supposed to premiere on April 2, but that plan has been thwarted by a thing we call the world wide web. The video leaked onto the internet earlier today, which you can at the above link. “Pom Poms” goes to radio this week. An album title and release date has yet to be released. This is the first single by the band to get a wide release since “Paranoid” in 2009. “Pom Poms” represents a different sound for the guys, who have been evolving musically since their debut album. With an accompanying marching band and cheerleaders, it’s not the first song to dive into the category. Remember “Be True To Your School” and “Mickey”? We’ll see if it helps or hurts them this time around. The boys will be interviewed on Ryan Seacrest’s KIIS-FM morning show at 10 AM Eastern on April 2. The official network television premiere of the “Pom Poms” video is on the same date on E! News, which airs at 7 PM Eastern.